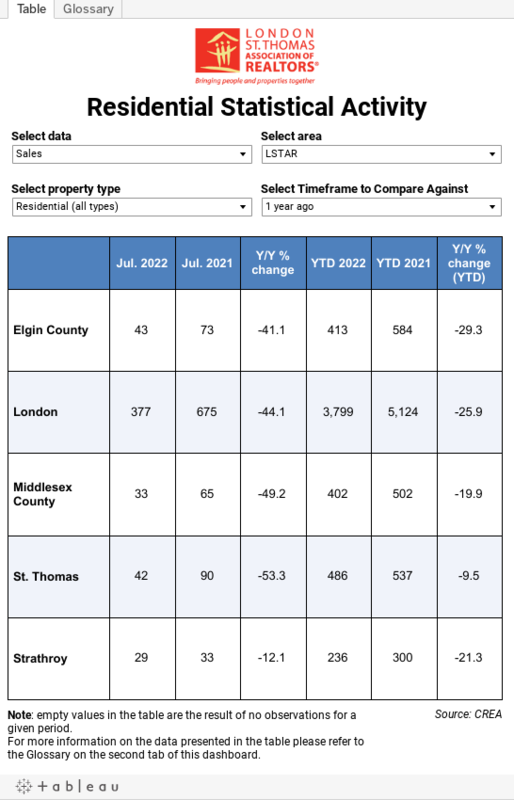 London and St. Thomas Association of REALTORS® (LSTAR) announced 814 homes* were sold in March, up 0.4% over March 2018. The number of home resales was right on par with the 10-year average and March was the third consecutive month to post gains over sales one year ago. "We've had a very strong start to the first quarter of 2019, with steady home sales all across our region," said Earl Taylor, 2019 LSTAR President. "Just three months into the year, there have been 1,939 home resales, which is an increase of 6.0% over the same period last year. If you're considering listing your home in the marketplace, it's a great time to get in touch with your local REALTOR®." One of the trends in March was the increase in inventory (called active listings) that was felt in several regions. "Overall, we saw 1,411 active listings in the marketplace, which is 14.5% more than March of 2018," Taylor said. "The communities that experienced the largest gains were St. Thomas, which had active listings increase by 51.1%, followed closely by London North, which saw a 51.0% increase, and Middlesex County with a 20.1% increase." Average home sales price continued to make steady gains in the five major areas of LSTAR’s jurisdiction. The largest year-over-year gain was in St. Thomas, with a March average sales price of $361,426, up 21.8% compared to March 2018. Meanwhile, in London, the March average sales price was $416,085, up 12.7% from the same month last year. The average sales price for the entire LSTAR jurisdiction was $405,956, an increase of 11.3% over March 2018. Average sales price does factor all housing types, including single detached homes, as well as high rise apartment condominiums. "The most popular housing type is the 2-storey home," Taylor said. "The average sales price for a 2-storey home in London was $554,015, up 5.3% from March 2018, while in St. Thomas it was $395,957, an increase of 13.8% over the same time last year." The following chart is based on data taken from the CREA National MLS® Report for February 2019 (the latest CREA statistics available). It provides a snapshot of how average home prices in London and St. Thomas compare to other major Ontario and Canadian centres. According to a research report1, a total of $67,425 in ancillary expenditures is generated by the average housing transaction in Ontario over a period of three years from the date of purchase. "The business of real estate continues to be one of the leading drivers of the economy, right here in our backyard and across the country," Taylor said. "Based on the March home resales, that's generating potentially almost $55 million back into the economy, over the next several years." The London and St. Thomas Association of REALTORS® (LSTAR) exists to provide its REALTOR® Members with the support and tools they need to succeed in their profession. LSTAR is one of Canada’s 15 largest real estate associations, representing over 1,700 REALTORS® working in Middlesex and Elgin Counties, a trading area of 500,000 residents. LSTAR adheres to a Quality of Life philosophy, supporting growth that fosters economic vitality, provides housing opportunities, respects the environment and builds good communities and safe neighbourhoods and is a proud participant in the REALTORS Care Foundation’s Every REALTOR™ Campaign. *These statistics are prepared for LSTAR by the Canadian Real Estate Association (CREA) and represent a data snapshot taken on April 1, 2019, based on processed home sales activity between March 1 and 31, 2019. 1Economic Impacts of MLS® Systems Home Sales and Purchases in Canada and the Provinces, Altus Group Economic Consulting, 2017. London and St. Thomas Association of REALTORS® (LSTAR) announced 814 homes* were sold in March, up 0.4% over March 2018. The London and St. Thomas Association of REALTORS® (LSTAR) announced it has presented $76,000 to nine local organizations, as part of its community engagement program.